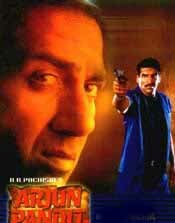 Arjun Pandit, a Hindi movie, is not currently screening in Hyderabad. Yes, Ghayal was a masterpiece, and Sunny Deol as a wounded, wronged victim of the "system" proved his point brilliantly. But to keep giving him similar roles and to expect the same magic is quite absurd, and typical Bollywoodish behavior. Sunny Deol probably keeps playing these roles as he is no stranger to the situation - he is a good actor caught up in a bad system. fullhyd.com has 700,000+ monthly visits. Tell Hyderabad what you feel about Arjun Pandit, and then also see all user reviews for Arjun Pandit!